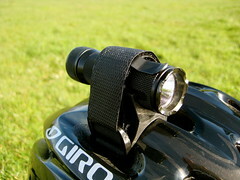 For the past few years I have been using a cheap headlight from Cateye on the front of my bike. When turned on to the blink setting, it did an acceptable job of making me seen, but it did very little to light up the road. Last January I decided that I wanted to replace or supplement it with a better light. I looked at the lights carried by various bike shops for a while, but none of them impressed me. 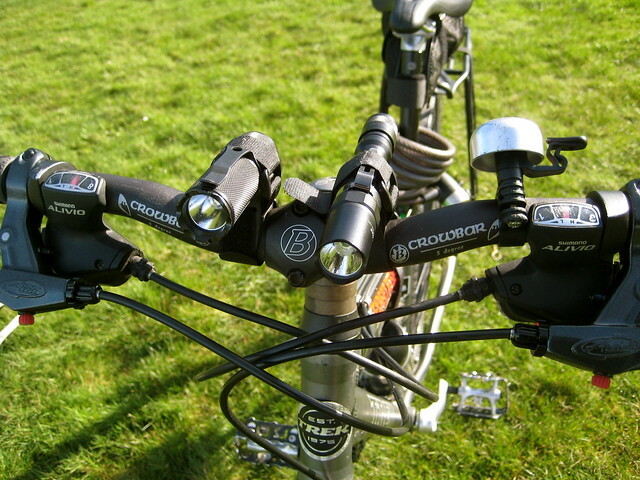 The high end bike-specific lights are bright, to be sure, but they tend to be much more expensive than a hand-held light of comparable output. I thought it would be neat if I could somehow attach a normal light to my handlebars. 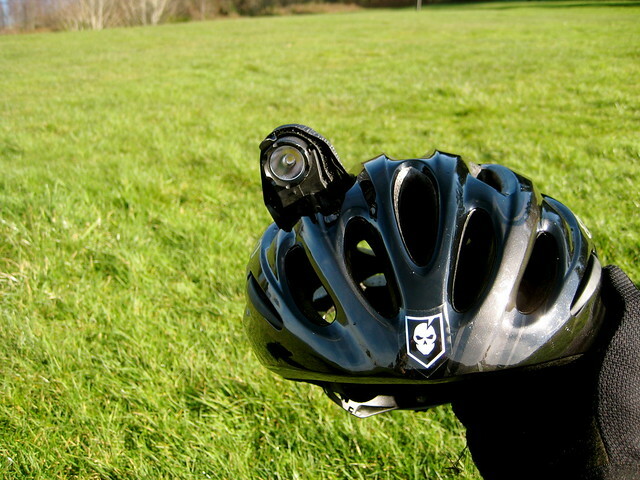 Not only would this be cheaper than purchasing the equivalent bike headlight, but the light would be multifunctional: appropriate either for my bike or my belt. None of my own hackish attempts to mount a normal light on the handlebars satisfied me, so it was with relief that I heard about a company called Twofish. 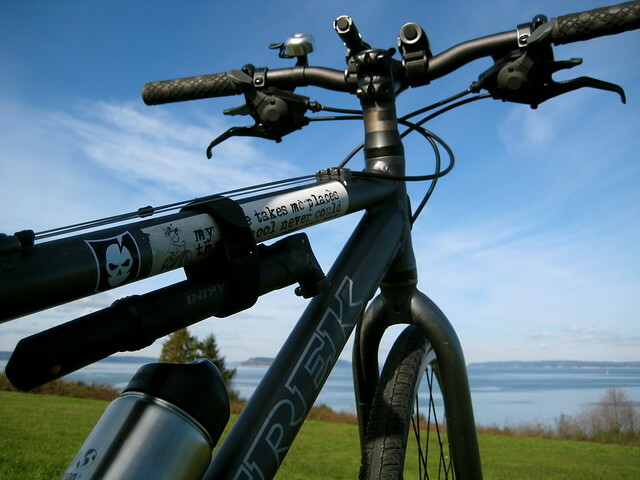 Twofish – not the cipher – is a company that makes a series of mounting devices for bikes. The two products that I purchased are the Lockblock and Bikeblock. 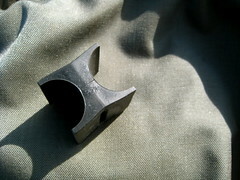 The Lockblock is a piece of rubber with perpendicular “U”s on either side. Each side fastens to an object with a small piece of hook-and-loop webbing. The Bikeblock is similar, but the two “U”s are parallel, and each side fastens to its respective object with a single continuous piece of hook-and-loop webbing. 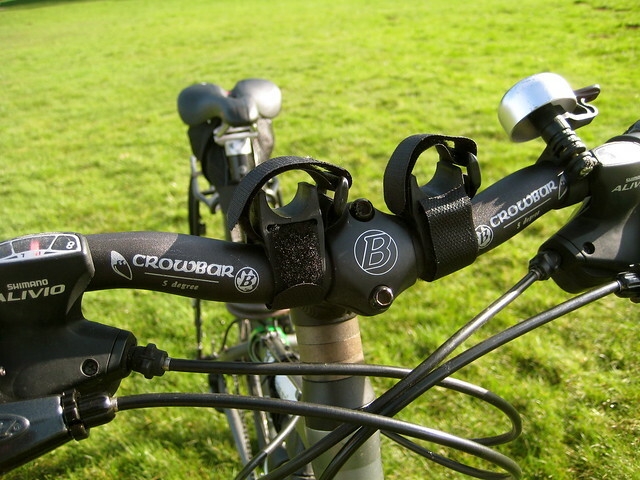 Lockblocks are to be used when you want to mount an object perpendicular to something else, such as a light on handlebars. Bikeblocks are appropriate when you want to mount the object parallel to something else, such as a pump to a frame. I bought three of each. My first use of the Lockblock was to replace the Cateye headlight with my old Novatac 120T. The difference was immediately noticeable on my first night-ride. The 120T lights up the road, both bringing me to the attention of motorists and bringing potholes to the attention of me. But I still thought it could be better. I wanted a second light. 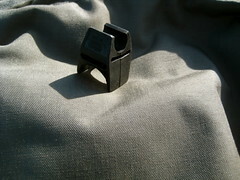 Research showed that the Fenix LD20 was a popular choice to use in conjunction with Lockblocks. It blasts out a fair number of lumens and I liked that it ran on AA batteries rather than CR123s, so I picked one up. The combination of the Fenix LD20 and Novatac 120T really light up the road. The Lockblocks hold both lights securely, and they make for a safe commute on long winter nights. Although I was happy with this setup, I wanted to try using the parallel mount of the Bikeblock to add a helmet light into the mix. The Bikeblock fastens easily and securely across the vents of my Giro Stylus. Between my two lights, the shorter profile of the Novatac 120T made it more appropriate for a helmet mount. I’ve been running the 120T on my helmet for about a week now. It’s nice to have the light point wherever I’m looking – and the ability to flash inattentive drivers is appreciated – but the light does add a noticeable weight. It’s annoying enough that I don’t keep the light on my helmet during the day, but so far I’ve been steadily putting it back after the sun sets. I haven’t decided if I’ll keep it up there, or if I’ll ditch the helmet light idea. 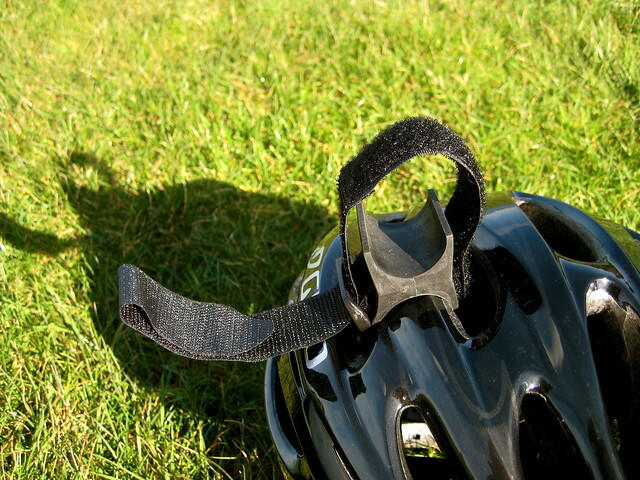 I think that as winter turns to spring and the days lengthen, the Bikeblock will come off of my helmet. I also use a Bikeblock for its intended purpose – to hold a pump to the bike frame. This is much more secure than my previous method, which consisted only of two pieces of hook-and-loop webbing. 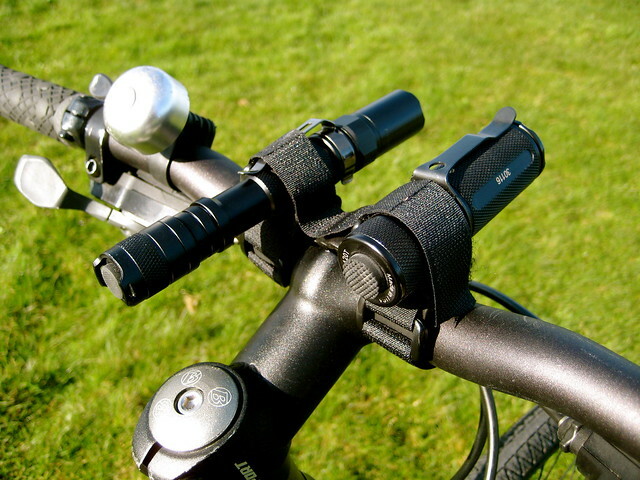 Twofish’s mounts offer a serious challenge to the standard bike-light market. I’m pleased with both the Lockblock and Bikeblock and cannot see any reason to move back to a bicycle-specific headlight. This post was published on 2011-02-20 . It was modified on 2012-09-30 . 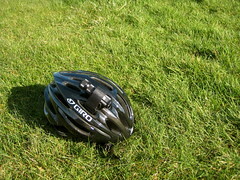 It was tagged with review, bicycle, gear.